We never officially thought of this, but with the schedule change of Big Brother 2014 this week, I guess they are moving up things with the comps and ceremonies. We just saw the Veto Meeting on the Big Brother Live Feeds, which never happens! We now know the final nominees for Week 11, a week that doesn’t even matter because of Big Brother Rewind! Check it out below in our Big Brother 2014 spoilers! As Frankie stated last night on the Live Feeds, he was going to keep the nominees the same and show his loyalty to the guys by doing so. He is a little worried about his standing in the game, especially with all the comp victories he has under his belt. He knows the guys should be coming after him, so he wants to keep them on his good side and put Victoria as the target, but we all know this week means nothing and we were all hoping for a little more excitement to out Frankie! So, it was done live on the feeds, which never happens. Frankie knew it was being done on the feeds and now the guys are in the old Have Not room with the golden button and Frankie is convinced there is a live show on Wednesday (which there is) and they think the mirrors in the room mean they have to reflect on their game. For now, I’m done until the show tonight! YES!! Please let that be the scenario! That would be sooooo sweet…. I barely dare to hope. I would so love for that to happen but I have gotten my hopes up too many times this season just to have them dashed. But given the choice of having one of them fulfilled, this would be THE one! I decided to look at the live feeds which is something I rarely do and happened to see the live feeds of the power of veto which Todd has already posted. It was kind of fun listening to these geniuses discussing what the words in the golden button room mean. One of the best things for me was reading some of the chat comments–my favorite was the one concerning the poor dog that is going to be coming in. One chatter said that dogs have such a keen sense of smell that once the poor doggie comes into that stinkhole, he will self-evict! Either that or he will keel over and need CPR. Just like here where the comments on this blog are so much better than the actual show! Dogs?? Sometimes I think I need the live feed to look at. But Frankie knows a lot about what things mean as far as the golden button and when the show will change. Seems to me there is only 1 way he can know this information. CBS. He said tonight the button could be a rewind button. They have never had one that I know of so why would he come up with that so quick. I don’t know something is just not right with this whole thing. Mary, I have not watched many seasons of BB but Cat said the other day that there was a rewind button in an earlier season and that even Derrick brought it up on the live feeds. Oh, and apparently CBS has the brilliant idea to place a poor animal in the house for 24 hours for the HGs to care for. I think a dog was selected but haven’t heard anymore about it. I do not like the idea at all. Ok. I just didn’t remember a rewind button. I didn’t watch it the first few years so maybe that is when it was. And all I can say about the poor dog is I know it is animal cruelty….Poor dog. Well, this season and last year are the only 2 I have watched in their entirety and that is mainly because I stumbled across this great board. I did see off and on episodes of several seasons but apparently missed the one Cat referred to. And I agree with you about the dog. Season 14. But it was called the “reset” button and not the rewind button. LOL! I sure wouldn’t let them anywhere near my cats! My cats are cootie-free and I want them to stay that way! Well, I’m sure production gives them “hints” but superfans (like Derrick) know about a resent button from BB12, I think. With nothing but time on their hands to think about things… it isn’t beyond comprehension that they’d draw some logical conclusions. All the more reason BB needs to come up with some NEW stuff so the twists really ARE twists! It was BB14. The season with the coaches. All the coaches hit the “reset”‘ button (which looks very similar to the rewind button). Derrick brought this up yesterday. In front of everyone. So obviously it got them all thinking. Not hard to make a good guess from that kind of info. Thanks, Cat! I am surprised I even remembered part of what was posted, LOL! I love this site. TODD, you are the best thing about Big Brother. Thanks. But Frankie can win HoH and the Power of Veto again and do the exact same thing he just did.. Yes he can and probably will. As I stated before, he’s a beast at comps. But it will still be fun to watch his face and she him squirm. 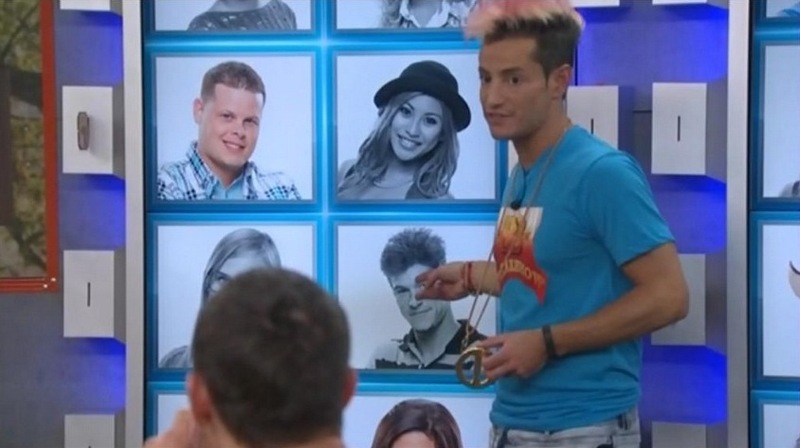 I hope Frankie loses too, but he’s very determined to win. I don’t think Victoria is dumb, she just gives up too easily. She doesn’t seem to have the drive to finish what she starts. She starts out strong, but when things get tough she gives up. I’ll be speechless if she wins anything this season. But, who knows? She could surprise us all. Nothing is impossible if you want something bad enough, so if she wants it bad enough, she could make it happen. After a short time this show will all be over. The outcome is academic to me and factually makes no difference at all. I reviewed a bit of documentation, my notes, and find that it is going to make a great chapter in my book. (pre-titled “the summer of 2014) IT WAS WORTH EVERY PENNY. Frustrating to the max, but worth it just the same. I have enough for a good sized chapter. I have confirmed many thoughts I have about reality TV and right now consider BB16 a candidate for the coup de grace. I plan to watch the upcoming Survivor to try and better understand the progressions of season one to date. The big story is comparing the human element in confinement to a building like hamsters (BB) and it’s effects vs the elements of Survivor with its limited food, often harsh weather, and physical breakdowns of several participants. On the surface Survivor is a much more manly game, but I am finding that confinement can take a toll that may just not be easily recoverable. Judging people subjected to this abnormal circumstance is unfair in many ways. I watched Jeff chatting with one of the evicted contestants the other day and he triggered a thought where he was advising the person to in essence “get back to reality”. That is a kick of a statement in that the show is supposed to be reality. Quite a chuckle there. He was sincere in his wording as he was sharing what appeared to be the need to “come down”, “relax”, and chalk it all up to the fact it is just a game. Not sure of copy-write in/on forums, thus I simply put to memory and noted interesting posts and replies that were contributory to my information gathering. I even went off subject in various ways to try and get valuable responses. Also pushed some limits to get responses of value. What I found interesting was the deep involvement forum participants have and how serious they get over a TV show. That in itself could produce another chapter. Great job Todd. I do have to hit a couple of fast and mean roller-coasters before the season ends, so a couple of day trips should do it. SNFE, Agawam, MA ….”Boulderdash” at Lake Compounce, CT….and the bone breaking “Yankee Cannon Ball” at Canobie Park in New Hampshire. Get to see some terrific fall foliage as well. Oh, no, another ego gone bad … did you not learn anything???? I think he already knows it. Despite 2 of the remaining HG participating in the CBS Thursday Night Football Promo comp reward earlier in the season, none seem to recall that it’s NFL season and CBS will be running football on Thursdays instead of Big Brother. Ha! Good observation and good point. I thought about that too They are all dumber than bucket of rocks. Thank you for the rant–it made me LOL! LOVED the proposal and the song that was sung and also the flashbacks of Jordan and Jeff in the BB house…. Me too, I enjoyed the whole thing. Bet Jeff & Jordan took showers as soon as they were out of the BB house. Hope they bathed the doggie, too! I noticed Frankie holding him. And I wish they would tell Derrick to stop saying “I’m torn”. I am so tired of hearing him say that I could scream. Anytime he doesn’t want to make a decision he says this. He can’t. He doesn’t want to get blood on his hands…haha. Ridiculous. LOL…I know. Him and that blood. I wish his hands would turn red. I just think it’s fixed. If Frankie wins, then I’m sure it’s fixed. I never heard of his “famous” sister, until he was on the show. Now her mug is everywhere, and when she “sings”, I have to hit mute or else my ears would be bleeding. I agree with you on all accounts. I read an article that stated his sister is a nightmare to work with and no one wants to work with her. She’s a spoiled brat. I guess it runs in the family. They’re 1/2 sibs, so it must be either the mom or dad that has allowed their poor behavior. But, then again, some people just think that they’re entitled and the world owes them something for being born so who knows why they’re both snot nosed brats. Like mother/father like daughter. Like mother/father like sun.